A website that focuses on land use, and on urban and suburban design is a particularly appropriate forum in which to discuss country clubs – those large occupiers of choice real estate – and how the social structure of country club membership fosters, institutionalizes and perpetuates racial attitudes that are decades behind the attitudes reflected in all other elite American institutions. The racial bias pervading elite country clubs is back in the news today, as rumors grow that the country club set is angling to assert its power in the Republican party by dumping newly-elected RNC chief Michael Steele. Katon Dawson, the South Carolina Republican party leader, made a pro-forma "effort" (one letter in August 2008) to reform the racial bias of members of his own country club, which should fool no-one about whether he really cares enough about racial integration. Dawson is at the center of rumors reported in National Review On-line (which Dawson denies) that Steele may be dumped if Republicans fail in the March 31st special election to take the New York congressional seat vacated by Democrat Kirsten Gillibrand, appointed to fill Hillary Clinton’s US Senate seat. Fifty-five years after Brown v. Board of Education (1954), it seems that every private school, university, major law firm, and corporate board room in Washington, D.C., has made a genuine (though by no means complete) effort at racial integration. In our working lives, and our children's school lives, we are more and more within an integrated environment that has moved beyond tokenism. So it is unsettling to set foot on the grounds of an elite country club, and enter a world that is as white as it would have been in the 1950s or, indeed, in the 1910s. I speak from experience. 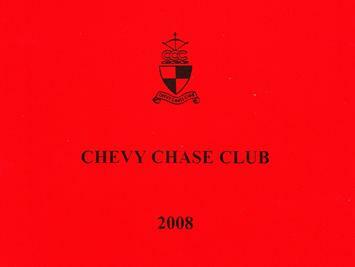 For four generations, my family have been members of the Chevy Chase Club, established in the late 1890s in Maryland just over the District line. As the club that sitting Chief Justice John Roberts chose to join (effective Sept. 2007), it has not only historical significance, it has current significance today, both in Washington, D.C. and in the nation as a whole. As described in The American Country Club, Its Origins and Development by James M. Mayo, the idea of the country club arose in connection with the development of the street-car systems that made possible the development of “street-car suburbs” in the late 1890s. Including a country club in connection with a housing development is a successful pattern that’s still used today to make new housing developments more attractive, by offering a center for golf and tennis, formal rooms in the clubhouse for wedding receptions and other gatherings, and restaurants for casual or formal dining. The problem arises because the suburbs, as conceived and developed in the 1890s, institutionalized racial segregation. At the time, successful efforts were underway — not just in the South, but in the North — to end the integrationist effects of Reconstruction and to enforce “Jim Crow.” The developer and first President of Chevy Chase Club was the noted virulently and openly racist U.S. Senator, Francis G. Newlands of Nevada, and there can be no doubt that Newlands, in choosing the others who would serve on the Board of his Club, chose only those who shared his racist prejudices. The initial Board was the body vested with the power to admit members: applicants who were “one of us”; people with whom the Board members socialized and knew well, and who no doubt shared these prejudices. Americans accustomed to the rapid pace of change in the US don’t realize the institutionalized resistance to change, extending over decades, that characterizes country clubs. Each one is a local “House of Lords” of heredity privilege and conservatism. Because membership in such a club is central to the sense of prestige and superiority that members cherish, once someone became a member, he (it was always “he” until a few decades ago when women were allowed to join in their own right) would never resign. Indeed, perpetuation of ancient attitudes is reinforced by policies in which persons who have been members for, say, 50 years, are released from the obligation to pay dues. Retired from their board rooms and law firms, for them, the club becomes their focus of attention, a place where they can preserve the kind of world they grew up in; a world where African-Americans exist to deliver drinks and meals to the tables. There was no need for bylaws to state a bar against African-Americans. Rules that required letters of support from a certain number of current members (today at Chevy Chase Club, 14 different members) to bring prospective new members forward provided a defacto exclusionary rule. The current members simply were not the sort of people who would ever get to know any African-Americans well enough to want to sponsor one. The racial attitudes of the older generation in power in the 1950s did not change when the Supreme Court said that the Constitution required integrated schools. Some of the private schools attended at that time by the children and grandchildren of members undertook efforts to integrate. St. Albans, in Washington D.C., my school (1973), which was also my father’s school (1950), admitted its first African-American student the same year as Brown; Sidwell Friends, my mother’s school (1952), did the same about a decade later. The leadership on racial matters was provided by the headmasters of these schools, who were education professionals and religious leaders who came from outside the clubby world of alumni-dominated boards, and who pushed their boards to integrate. It did not find a counterpart in the leadership of the clubs. By the early 1970s, when my own class at St. Albans was about 10% African-American, and when the president of the student body, Randall Kennedy (now a noted professor at the Harvard Law School) was African-American, the membership of the Club was still lily-white. It was impossible to know if there might be one or two African-American members. Certainly none of the photos in the club bulletins of the children who played in the tennis or golf tournaments included anyone other than whites. Almost 40 years later, nothing has really changed. And if left to themselves, these clubs will never change. The reactionary “House of Lords” mentality of the older generation filters out dissenters of the younger generations, and ensures that only those members of the new generation who accept the attitudes of the old rise to positions of power. The progressive integration of more and more institutions of society signals an increasingly great disconnect between the clubs and the rest of society. It tells our children that in school they are in an integrated environment, but when they cross the boundary line onto the grounds of a club, they enter a whites-only environment. For their parents to be members, and yet condone this, tells the next generation that we, their parents, feel a segregated environment is OK.
For governments to permit golf courses that are, in effect, segregated plantations in the midst of fancy neighborhoods, sends an unacceptable signal to everyone who drives past these large reserved tracts of racially-exclusive land. When I see Tiger Woods take a swing on the course of one of these clubs, I wonder: Does he realize the symbolic sense of what he is doing? Country clubs such as Chevy Chase Club are institutions of exclusion and segregation whose time has passed. No longer do they serve as magnets to increase the value of newly-developed land. Instead, now they are obstacles to the integration of society as a whole. The leaders of these clubs, through their political donations and social positions, wield tremendous power in county and state politics. So meaningful change is unlikely to come about without federal action. There is little hope that these clubs can ever meaningfully reform themselves from within, without significant outside pressure. The larger community can and should take action. I propose an increase in real estate taxes commensurate with the value of the land if it were turned into de-segregated residential or commercial use. The Department of Housing and Urban Development should institute a program whereby it calculates the total taxes from real estate value, sales revenue, and other sources that a city or county would generate if a private club or golf-course were instead developed similarly to the land-use patterns around it, such as residential or retail use. The amount of various federal grants and subsidies to the relevant city, county, or state could then be reduced by that amount. Federal aid to local government could then be freed to aid neighborhoods that need it far more. And those communities that condone the continued operation of defacto segregated leisure plantations would have to face the financial implications of allowing prejudiced institutions to continue to operate as if still in the world of a racially-prejudiced past. Edward Sisson is a Washington, D.C., lawyer and cultural commentator. Submitted by raynaa1122 on Sat, 06/06/2015 - 02:00. Submitted by raynaa1122 on Fri, 06/05/2015 - 03:14. Submitted by raynaa1122 on Thu, 06/04/2015 - 14:12. Submitted by raynaa1122 on Thu, 05/28/2015 - 01:57. Submitted by raynaa1122 on Tue, 05/26/2015 - 13:19. Submitted by raynaa1122 on Mon, 05/25/2015 - 08:13. Submitted by raynaa1122 on Sun, 05/24/2015 - 12:59. Submitted by raynaa1122 on Sun, 05/24/2015 - 10:42. Submitted by raynaa1122 on Thu, 05/21/2015 - 15:23. Submitted by raynaa1122 on Thu, 05/21/2015 - 09:57.